Hurricane Joan making landfall in Nicaragua. 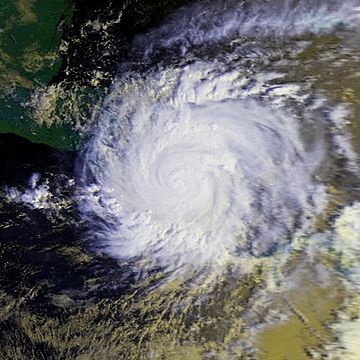 Hurricane Joan was a powerful and deadly hurricane during 1988. Over 200 people died because of Joan. The hurricane reached Category 4 strength. Hurricane Joan–Miriam Facts for Kids. Kiddle Encyclopedia.